Visitor berthing tariffs in Puerto Calero for monohulls are based on a modular system according to berth size. Monohulls (≤16m LOA): Daily rate: 0.33€/m². Min. occupancy 90 days. Min. monthly rate: 200€. (Includes water, wifi and electricity). Six-month and limited anniversary annual berthing packages are currently available. (Min. occupancy 180 days). 10% discount is applied with annual contracts. Water and electricity included. If you are a member of any of these associations, do let us know to see if we can apply a short-term discount. We offer a series of discounts with prepayment for longer stays. This simply means paying for your stay upon arrival. One berthing extension of 7 days is permitted at the same rate. Please take care to pay this either before or on the last day of your previous contract. Calulate your vessel’s surface area for multihull rate and special offers. In Puerto Calero these services are included in the berthing fee for boats less than 20m LOA. 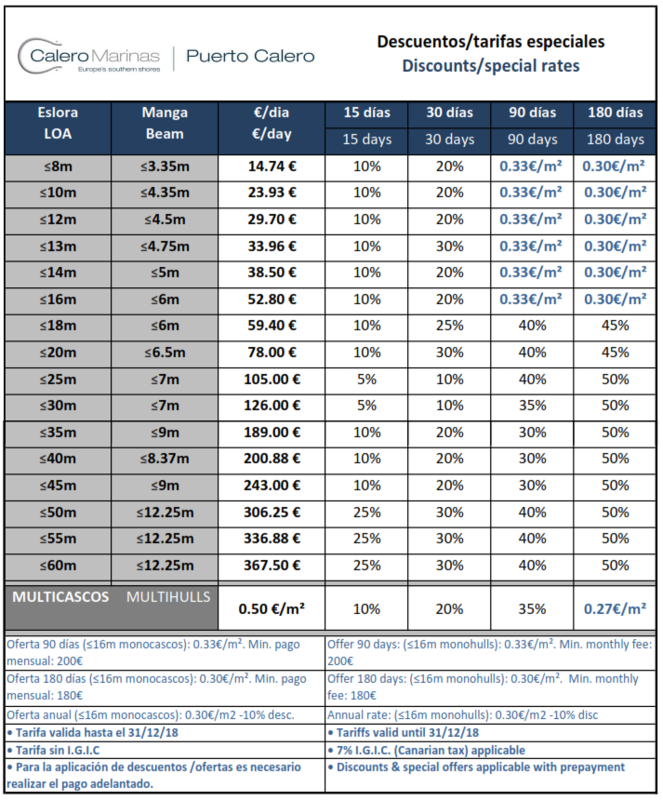 With vessels of ≥20m, electricity is charged separately at 60€ (+IGIC) for a three-phase connection further to 0.25€/kW. Water use is also charged at .0045€/lt. (Min. charge: 5€). Storage lockers (sized approx 2m x 2m x 2m) can be rented from the Marina Office at a cost of 90.15€ per month. For a wifi internet access code, please request this in the marina office. 7% IGIC – or local Canarian VAT – is applicable to all tariffs shown here. We recommend that where possible, you make a reservation using the form provided in this site. Rates and offers shown here are valid for reservations made before the 31st December, 2018. If you require any further information on rates in the marina please contact us by sending an email or by phone.